Mark Ashley is Evolution Woodworks. Mark has been working with wood for more than 25 years. 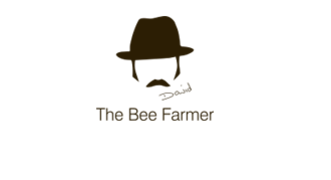 His experience has been gained in the shop-fitting, cabinet making and boat-fitting trades. The traditional approach used in designing and crafting bespoke English narrowboats provided the inspiration for Evolution Woodworks. Solid timbers are worked with hand tools as much as possible, Designs are inspired by traditional woodwork and completely hand-finished, with some modern techniques where appropriate. Flexibility in design and production is what Evolution is about. 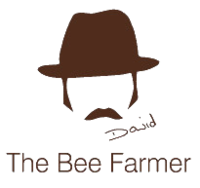 David The Bee Farmer and Mark met at The Ashby Agricultural Show. David was struck by the design, execution of the work and choice of timbers. The porch chair is an example. It is a classic design, made in Redwood which has natural weather resisting properties. The chair folds for easy storage and there is a foot stool as a companion piece. The wide arm rests are just the place for your nibbles and a fortifying drink. Mark being interested in finishes was intrigued by The Bee Farmer's Spoon Butter. 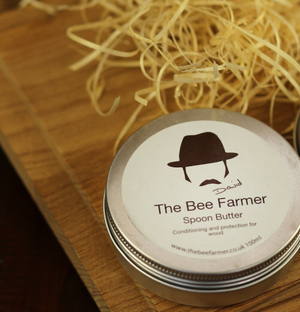 Spoon Butter is a blend of Walnut Oil and Beeswax. Walnut oil is very light and is readily absorbed by the timber. The beeswax provides a protective surface. A pleasant side effect of the Spoon Butter is that it intensifies the natural colour and figuring of the timber. The Spoon Butter is easy to work into the wood and has a non-streaky finish. As with all beeswax polishes the more the polish is applied the greater the patina develops. Mark's mantra is that wood should not just look good, but as a tactile substance it should also feel good to the touch. 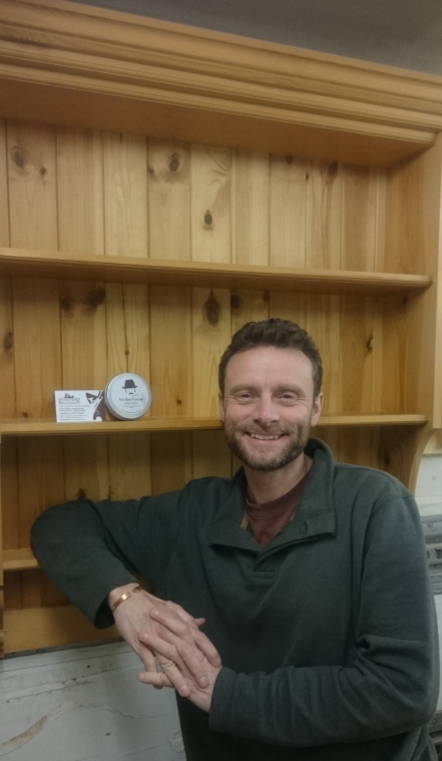 Mark, being a curious minded fellow, has experimented with stains, market leading wood finishes and Spoon Butter. Mark discovered that the solvent in the market leaders tends to lift the stain from the wood. Spoon Butter having no solvents and negligible pigmentation makes a good finish over a timber that has been stained as it does not modify the colour or lift the stain. Spoon Butter being made from natural products is solvent free and makes a great job of rejuvenating wood that gets wet on a regular basis such as chopping blocks, worktops and wooden spoons. Can you guess where the name came from? It works just as well on all wood surfaces. It has no sticky residue and has no taste or smell. Spoon Butter is a food safe polish. It has no odour or taste. It is a blend of beeswax from my hives and Walnut Oil. Spoon Butter is for use on wood surfaces where they come into contact with food. The surfaces have to be cleaned. Cleaning products remove the grime but also the natural oil and moisture from the timber. The Walnut Oil replaces the lost elements penetrating into the timber providing protection from drying and brings out the figuring of the grain. The beeswax embeds into the surface grain providing a moisture barrier but also buffs up the lustrous sheen. Spoon Butter is for use on kitchenware such as Wooden spoons, hence the name, chopping blocks, bowls, pan handles and worktops. It works just as well on dining tables and other timber furniture. Wipe on with a soft cloth, working in broad sweeps across the grain. Leave until the surface until it takes on a misty look then buff the surface with a clean soft cloth. A patina will develop over time. 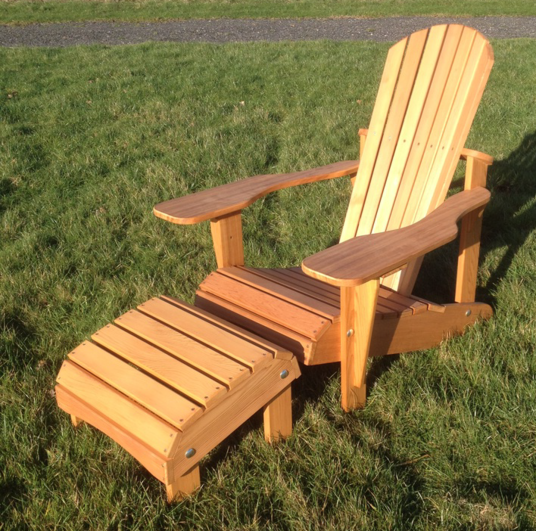 Evolution Woodworks in Tamworth use The Bee Farmers Spoon Butter on their outdoor and indoor furniture.